Similar to humans, non-human primates combine gestures, facial expressions, and vocalizations in various ways to communicate effectively. Researchers of the Max Planck Institute for Evolutionary Anthropology investigated one such signal, the 'leaf clip' gesture, which re-emerged in a wild chimpanzee group during an alpha takeover. Importantly, the gesture was produced only by adult male chimpanzees, immediately preceded their pant hoot vocalizations and was associated with acoustic changes in those calls. "Leaf clipping is a special behaviour. It is a rare example of tool-use in a communicative context and has been proposed to be cultural, varying in its meaning in different social groups of chimpanzees", explains Ammie Kalan, the lead author of the study. Since leaf clipping is relatively rare, little is known about it. "Although only three adult males were observed to begin leaf clipping during our study period, by now we know that all of the mature males of the South group chimpanzees of the Taï forest do it", clarifies Kalan. 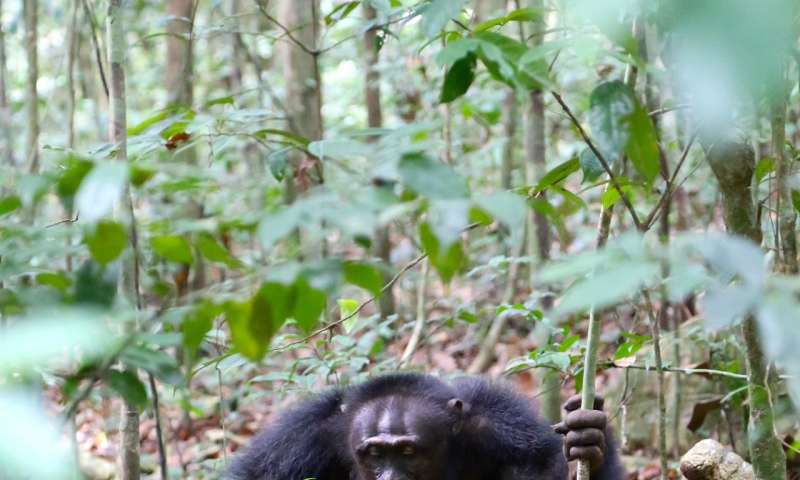 This is the first research examining how the leaf clip gesture, paired with a pant hoot vocalization in this group of chimpanzees, is associated with changes in the call's acoustics. In fact, it is the only study demonstrating this kind of complexity in chimpanzee communication. Using detailed acoustic analyses of pant hoot vocalizations and observations of leaf clipping behaviour, the authors show that pant hoots preceded by leaf clipping were more acoustically salient; they were longer, had more calls, more buttress drumming beats and lower frequencies. Moreover, during the alpha takeover, pant hoots also showed variation but the acoustic changes were different from those observed with leaf clipping. "We cannot be sure of the exact mechanisms at play here since leaf clipping does not occur at the exact same time as the pant hoot but immediately before it", explains Kalan. "However, we think that leaf clipping probably re-appeared in this group due to the high arousal and aggression in the group during a time of peak male-male competition." The authors also note in their article that males seemed socially frustrated and stressed during this period of hierarchy instability; therefore the leaf clipping may have helped to alleviate some of these effects. "Often, pant hoots by Taï chimpanzee males incorporate buttress drumming and are critical parts of the male display where vocal and physical prowess of individuals is demonstrated. Male displays are most likely important signals for regulating competition between males during periods of hierarchy instability; therefore, in hindsight, it is not surprising that leaf clipping re-emerged in this group at this time", describes Kalan. Finally, the authors emphasize that it will be necessary to look at this phenomenon further in other chimpanzee groups and to examine the potential mechanisms that could explain these results. "This study adds to our understanding of the complex and multilevel nature of communication in wild chimpanzees, especially considering that combining signals, such as gestures and vocalizations, is a powerful way to gain communicative flexibility", says Kalan. Can chimpanzee vocalizations reveal the origins of human language?